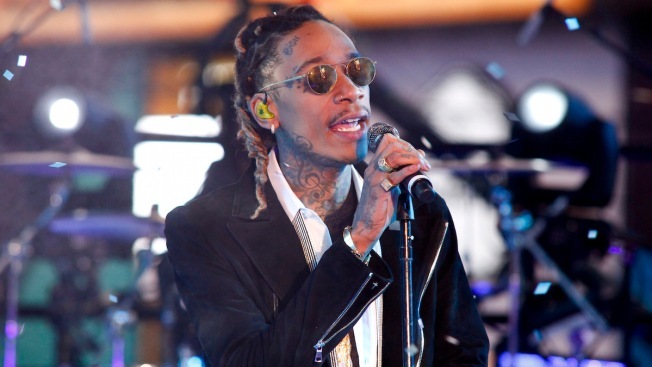 File - In this Dec. 31, 2015 file photo, Wiz Khalifa performs at the Times Square New Year's Eve celebration in New York. The rapper is receiving backlash after posting photos of himself smoking at the site of the tomb of Pablo Escobar. American rapper Wiz Khalifa is stirring controversy in the South American nation of Colombia, where he laid flowers and smoked what looks like a joint at the tomb of cocaine kingpin Pablo Escobar. The rapper is an avid marijuana smoker and used his Instagram account to post several photos of him smoking at Escobar's tomb in Medellin. He played a concert in the city last week. Colombians took to social media to express outrage. Medellin's Mayor Federico Gutierrez called the rapper a "scoundrel." He suggested that instead of paying homage to Escobar, the performer should've brought flowers to Escobar's thousands of victims killed during the height of Colombia's drug violence in the late 1980s.